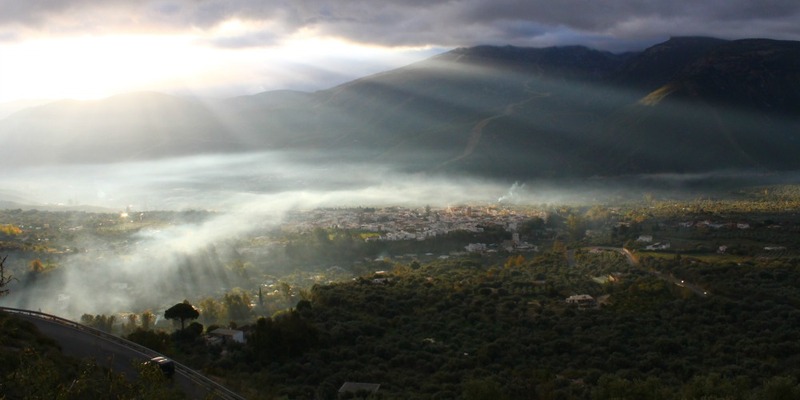 Situated in the lush valley of the Rio Guadalfeo, Órgiva is the largest and most populous town of the Western Alpujarra and provides a hub for some of the more remote High Alpujarran villages and those to the South East. It makes for a great base from which visitors can explore the mountains and, while the town itself won’t be featuring on any chocolate boxes, the surrounding area is absolutely stunning. It is a windy 30 minute drive from the motorway whether you are coming from the direction of Granada, via Lanjarón, or taking the southern approach from the coast which skirts the northern slopes of beautiful Sierra Lújar. The latter route gives spectacular views of the Sierra Nevada especially during the winter months. See map below. People are drawn here by the promise of peace and quiet in the mountains, the stunning views, the proximity to the coast (30 minutes to Salobreña) and of course the Andalucían hospitality. After you have spent any time at all in this town you will recognise that one of its key characteristics is diversity. 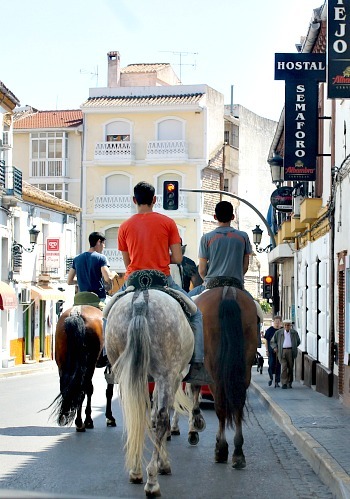 Whether people come here to visit, or end up settling, Órgiva attracts all sorts. This is reflected in the relaxed vibe that permeates the area and the large number of visitors from spring through to autumn. Órgiva featured in Chris Stewart’s bestselling Driving Over Lemons, an account of setting up home and family in La Alpujarra at a time when it was considerably more ‘spit and sawdust’ than you will find it now. Situated in a ruggedly beautiful ravine on the outskirts of the town is the ‘hippy’ community of Beneficio where the residents strive to live simple lives in tandem with nature and away from such worldly items as cars, mobile phones and alcohol. Further down the valley, and across the river, there are the two other ‘off-grid’, and longer standing alternative communities of El Morreón and Los Cigarrones. Until recently it was home to the famously ‘messy’ and long Dragon Festival which has now been moved along from Órgiva’s doorstep, in Los Cigarrones on the southern bank of the Guadalfeo, to a more wide-open-space near Santa Fé on the outskirts of Granada. Órgiva is very well placed for trips to the beach and into the mountains. Taking the southern route out of town and to the motorway you can be on the beach in Almuñécar within 45 minutes. Alternatively you could take a drive or a tour up into the hills to explore the charming whitewashed villages of La Alpujarra. There are some great walks around the town which will take you up the Río Chico or along the Guadalfeo to the south, or you can follow the Ruta Olivos Centenarios, a 9km circuit passing ancient olive groves (see map). Here is a lovely account of this particular route from local blogger Con Jamon. You might also want to check-out Spanish Highs Sierra Nevada a local company, based in Lanjarón, who specialise in walking holidays in the area. Whether you are looking for holiday rentals, hotels, B&B, camping, glamping or even retreating there are some great accommodation options in and around Órgiva. Here’s a pick of the best. In town you have Hotel Puerta Nazarí, Hotel Mirasol and the charming Casa Jazmin guest house. Just outside town is the Hotel Taray Botánico, which features a lovely pool in lush gardens and the hugely popular restaurant, El Flor de Limonero. If you would prefer something a little bit more remote with fresh mountain air and views to die for, but still not too far from the civilisation, you could head up into the hills to Almond & Olive Boutique B&B Retreat just 25 minutes from Órgiva. If you are looking for good value and family fun, Camping Órgiva, or ‘Bottom Camping’ as it is affectionately known by local expats due to it’s location on the road leading south out of town, is another option well worth exploring. If you are staying a week or two in the area you will find plenty of places to keep you fed, and fairly well entertained, in Órgiva. Here are some favourites with locals and visitors alike. Please see the map below for all locations and check out our essential tapas vocab guide here. Pizzería Almazara has a great outside space, with children’s climbing frame, making it a great option for families with young children in the summer. Overall the food is great and in particular the pizzas are excellent and the salads, though not typically Spanish, are delicious. There is enough variety on the menu for more than a couple of visits and you will be made to feel very welcome by the friendly and helpful staff, some of whom speak English. Agua viva (used to be El Limonero) is perhaps the most surprising on the list, in terms of what you might expect to find in a small Spanish town. This restaurant, scores high on quality, variety, creativity and presentation. You will find dishes from all over the world and a great value weekday menu del día offering three courses plus a drink for €10. Look out for the Indian Thali night every Thursday evening. What was once the excellent El Limonero, where Agua Viva now stands, is now El Flor de Limonero at Hotel Taray Botánico. This is another favourite with the GranadaSpain family for Sunday lunch when we want to push the boat out just a little. Here you will find food that is an elaboration on traditional Spanish food. For something a bit more typical of the area there are lots of places to choose from but this list wouldn’t be complete without mentioning two in particular. The restaurant at El Camping Órgiva, on the road out of town, does great tapas and does a roaring Sunday lunch trade the year round. They have very friendly waiters and there is a play park for the kids. The other is El Molino Viejo in the centre of town, where the food and service are great, has a courtyard and a cosy indoor dining room making it a popular choice whatever the weather. Baraka, at the top of town near the market, is a cosy halal restaurant and teahouse serving delicious vegetarian and vegan food plus fresh juices and homemade ice creams, milkshakes and lemonades in the summer months. If you are looking for a bit of a change speed and menu here you will find arabic dishes, such as kebabs, cous cous, tajin and hummus, served alongside more typical Spanish food like tortilla, and gazpacho. English is also spoken here. And if you want to get a feel for the more social side of market day Baraka is the place to be. Other places: Bar Sastago if you fancy sitting out on the Plaza in the sunshine with a café con leche or cerveza. Galindos bakery is a great choice for snack and a rest and to watch the world go by. El Recreo, recently opened by the the same people who run El Camping. Also Pizza ‘n’ love and De Curtis Cafe both offer great pizza. Thursday is market day in Órgiva which is a big draw for the locals and neighbouring villages as well as attracting a colourful crowd from communities such as Beneficio. The offering is fairly typical and includes a great range of fruit and vegetables, and other local produce, alongside stalls selling shoes, clothing, and hardware. You will also find handmade jewellery, bespoke kids clothing and other stalls that reflect the creative ‘New Age’ vibe of the town. Be aware that the market can get very busy, hot and airless during the summer, so go early to avoid too much discomfort. Órgiva offers a number of small supermarket chains, including the ubiquitous Día and Covirán. If you are self-catering I would recommend Día for the basics and Supermercado Alpujarra for anything more ‘exotic’ or international. There is also an indoor market where you can find fish and meat and organic fruit and veg which appeals to the more eco-conscious consumer. You won’t find too much in the way of souvenir shopping, which some might consider a bonus, but there are a couple of boutique gift shops (see map). If it is souvenirs that you are looking for, you will have more joy in Lanjarón or Pampaneira, one of the most famous of the white-washed villages of the western Alpujarras. As with most small Spanish towns the shops will shut for siesta time – 14.00-17.30 as a general rule although times will vary from shop to shop – and most places are shut on Sunday. There is one kiosk on Avenida de los Robles (see map) where you can find basics, such as bread, milk and wine, on a Sunday. So if you are arriving on a Saturday, which is a common handover day for holiday rentals, you might want to do your food shopping that evening.